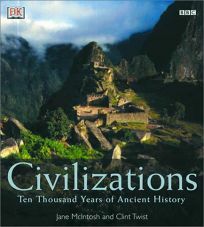 In Civilization: Ten Thousand Years of Ancient History, Jane McIntosh (The Practical Archaeologist) and Clint Twist (Historical Atlas of the Celts) explore the first 10,000 years of civic life. Beginning with the first agricultural settlements ""the moment when... the pace of change accelerated, leading rapidly to the very different world in which we live today"" the authors look at Mesopotamia, Egypt, India, China, Greece and the Roman empire, finishing up with the Incas and Aztecs. Shipbuilding, aqueducts, pyramids, pottery and technologies of every variety are given fresh consideration. With more than 270 color photographs and illustrations, this large-format book will entertain and illuminate.